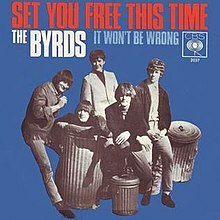 (1965) "Set You Free This Time"
(1966) "It Won't Be Wrong"
1966 German picture sleeve of "Set You Free This Time/It Won't Be Wrong"
"Set You Free This Time" is a song by the American folk rock band The Byrds, written by band member Gene Clark and first released in December 1965 on the group's Turn! Turn! Turn! album. According to Clark, the song was written in just a few hours during The Byrds' 1965 British tour, after a night spent carousing with Paul McCartney at the Scotch of St James club in London. The song's lead vocal is performed by Clark, who also plays acoustic guitar and harmonica on the track. "Set You Free This Time" concerns the breakup of a relationship and Clark's vocal inflections and densely worded lyrics suggest the influence of Bob Dylan. The song also has a vague country rock feel to it, largely due to the song's melody and Clark's harmonica solo. The chord progression and rhythm of the song, however, are atypical of country music. Following its appearance on the Turn! Turn! Turn! album, the song was issued as the A-side of a single on January 10, 1966. However, initial sales were relatively poor, with the single only managing to reach #79 on the Billboard Hot 100. As a result, Columbia Records in America began promoting the single's B-side "It Won't Be Wrong" instead, which resulted in the single eventually climbing to #63. In the UK, after a review in the NME stated that the B-side was better than "Set You Free This Time", CBS Records went a step further and actually re-released the single with "It Won't Be Wrong" as the A-side. This re-issuing of essentially the same single twice within two weeks caused confusion among British radio DJs over which of the two songs they should play and contributed to the single's failure to chart. To accompany its UK release as a single, the BBC commissioned a short promotional film from The Byrds. However, on the day of filming a physical altercation occurred between the band's manager Jim Dickson and rhythm guitarist David Crosby and although some footage was shot, the clip was never aired. Despite its lack of commercial success, the single release of "Set You Free This Time" gained mostly positive reviews in the music press. The first edition of Crawdaddy! magazine described it as "a lovely, moving song with Dylan-like 20-syllabal lines deckful of well chosen words." In the UK, Penny Valentine was complimentary in her review of the song for Disc magazine, commenting "On first play, I didn't like it – but now I do. It's rather unByrd-like and very, very Dylan-like. It's slow and gentle and rather sad about never being a person who had much, and though she laughed at him and has now come for help, he doesn't hold a grudge. Ahh!" The Beatles' drummer, Ringo Starr, reviewing the single for Melody Maker, commented "I only heard it the other day. They can do no wrong in my book. Great record, man, I love the voices." During February 1966, The Byrds performed "Set You Free This Time" on the U.S. television programs Hollywood A Go-Go, Where The Action Is, The Lloyd Thaxton Show, and Shivaree. However, the song disappeared from the band's live concert repertoire following Clark's departure from the group in March 1966. During his solo career, Clark would often return to the song in live concerts and consequently, it appears on his live albums In Concert and Silverado '75: Live & Unreleased. The Byrds' recording of "Set You Free This Time" is included on several of the band's compilation albums, including The Original Singles: 1965–1967, Volume 1, The Essential Byrds, There Is a Season, and the expanded and remastered edition of The Byrds' Greatest Hits. It has also been included on the Gene Clark compilations, Echoes, American Dreamer 1964–1974, Flying High, and Set You Free: Gene Clark in The Byrds 1964–1973. ^ "Turn! Turn! Turn! album review". AllMusic. Retrieved 2009-12-09. ^ a b Rogan, Johnny. (1998). The Byrds: Timeless Flight Revisited (2nd ed.). Rogan House. pp. 541–546. ISBN 0-9529540-1-X. ^ a b Rogan, Johnny. (1998). The Byrds: Timeless Flight Revisited (2nd ed.). Rogan House. p. 144. ISBN 0-9529540-1-X. ^ Hjort, Christopher. (2008). So You Want To Be A Rock 'n' Roll Star: The Byrds Day-By-Day (1965–1973). Jawbone Press. p. 66. ISBN 1-906002-15-0. ^ Rogan, Johnny. (1998). The Byrds: Timeless Flight Revisited (2nd ed.). Rogan House. p. 700. ISBN 0-9529540-1-X. ^ Rogan, Johnny. (1996). Turn! Turn! Turn! (1996 CD liner notes). ^ "Set You Free This Time review". AllMusic. Retrieved 2009-12-09. ^ a b c d Hjort, Christopher. (2008). So You Want To Be A Rock 'n' Roll Star: The Byrds Day-By-Day (1965–1973). Jawbone Press. p. 79. ISBN 1-906002-15-0. ^ a b c d Einarson, John. (2005). Mr. Tambourine Man: The Life and Legacy of the Byrds' Gene Clark. Backbeat Books. p. 86. ISBN 0-87930-793-5. ^ a b Rogan, Johnny. (1998). The Byrds: Timeless Flight Revisited (2nd ed.). Rogan House. p. 156. ISBN 0-9529540-1-X. ^ Rogan, Johnny. (1998). The Byrds: Timeless Flight Revisited (2nd ed.). Rogan House. pp. 131–134. ISBN 0-9529540-1-X. ^ a b c Hjort, Christopher. (2008). So You Want To Be A Rock 'n' Roll Star: The Byrds Day-By-Day (1965–1973). Jawbone Press. pp. 82–83. ISBN 1-906002-15-0. ^ Hjort, Christopher. (2008). So You Want To Be A Rock 'n' Roll Star: The Byrds Day-By-Day (1965–1973). Jawbone Press. pp. 84–87. ISBN 1-906002-15-0. ^ a b "Set You Free This Time – Gene Clark album appearances". AllMusic. Retrieved 2010-05-22. ^ a b "Set You Free This Time – The Byrds album appearances". AllMusic. Retrieved 2010-05-22. The Byrds lip-synching "Set You Free This Time" on Shivaree in 1966. This page was last edited on 6 November 2018, at 05:21 (UTC).